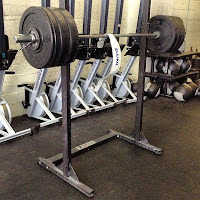 Last week I left you of with my nerves at doing a 5x5 back squat at 295 lbs. I did it, it was really effen hard. As the Monday 5x5 always is. However, the third set felt as hard as my fifth set usually does. So I know my body wasn't as recovered as it usually is. Sweat makes you look swole. Don't fear the sweat. 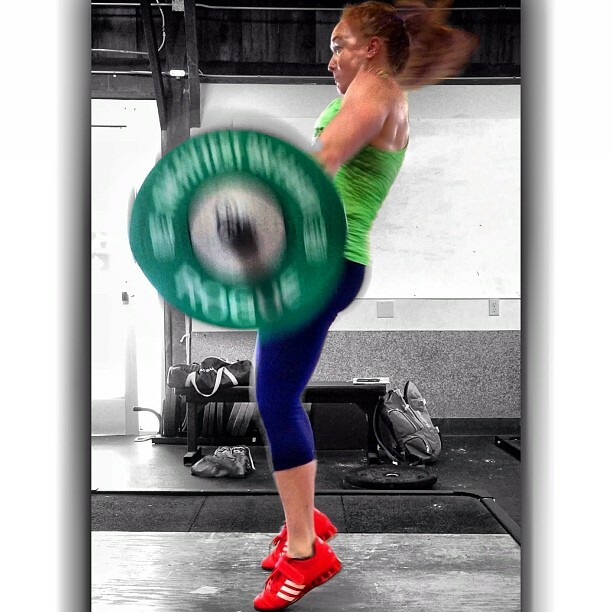 Tuesday my cleans (clean-front squat-clean complex) were kind of all over the place. The second clean kept getting away from me and my legs felt slow and heavy. I even bailed out of a 193 lbs clean at the end. I called it a day and did some push presses out of the jerk blocks. It's time to get my shoulders stronger. Wednesday is when it really hit home that my body needs me to back off a little. I was slated to do my front squat triples, eight sets, at 245 lbs. 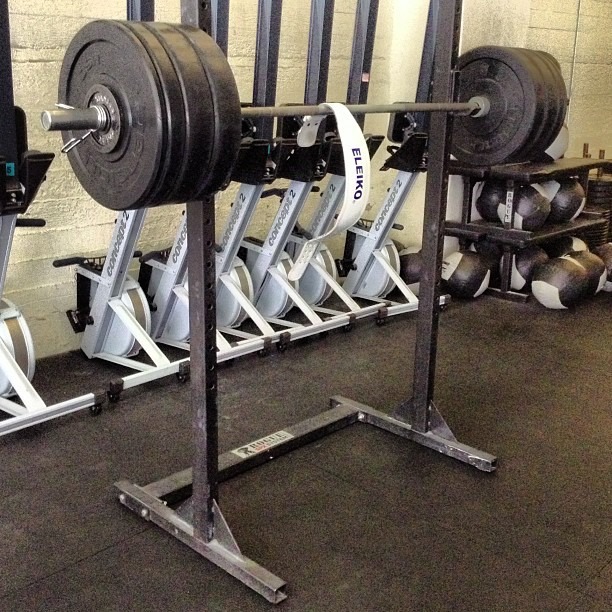 [Insert massive complaint fest about front squat triples.] Triples usually look like squat - squat - sad rainbow. These, however, looked like squat - sad rainbow - rise from the crypt. They looked awful, they felt awful. I got through them. It was gnarly. So considering my body is revolting a little, and my Mom is coming in to visit, what a perfect time for a deload. I took all of Thursday off, after all, Mom was flying in and I needed to run errands and clean house for her. 300 lbs. Squatted for three. Super psyched. Friday I went to the gym like normal. For a typical week, I would have attempted 300 lbs for 8x3 in the back squat. I decided that I would just do one set of three at that weight. It felt good, not terribly heavy, but muscles were definitely complaining in ways they usually don't. I could have pushed through all eight sets, I had time and definitely have the energy for it. But then what would come of it? So Friday I did my one set of three at 300 lbs. Monday I'll do one set of five at 300 lbs. Wednesday I'll do one set of three in the front squat at 245 lbs again. And Friday I'll be right back at it with 300lbs for 8x3 in the back squat. It's usually the volume that beats me up more than the weight on the bar, assuming I'm not pushing it to a one rep max. Most mortals need to back off their training occasionally to let their bodies heal. If you've been in the fitness game in any capacity for sometime, you've probably noticed how if you take a break from the gym, for any reason, you seem to be stronger when you come back. Basically, while most people train and eat to maximize recovery and progression, you still need to give your body a break from the constant cycle of tear apart and build up. There have been some research on how frequently strength athletes should deload. It seems that men needed to deload, on average, every four weeks while women could go a little longer, 5 to 6 weeks. Just from observation, I seem to fit that model, needing a deload every 6-7 weeks. I can't for the life of me find again where I read this. It had to do with how women don't recruit muscle fibers are efficiently as men, and therefore, can generally train longer before a deload because we're not tearing these fibers up as quickly. Regardless of science, many women find that doing four week cycles helps keep them feeling in tune with their menstrual cycles. Again, bodies and snowflakes and whatnot. The common method I've seen with weightlifters is to basically keep to your training schedule (if Monday is a clean complex day, it's still a clean complex day) but the volume and intensity is reduced. The extra time is spend on accessory work, technical work, and the usually much needed myofascial release. 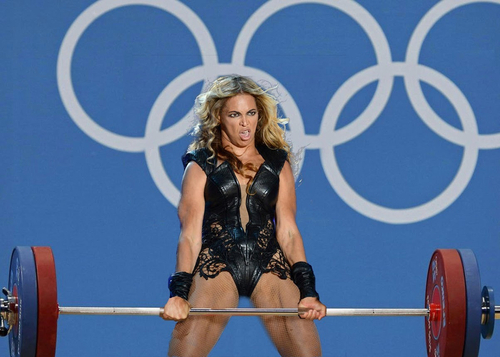 Beyonce usually has three reds on her deadlift. Deloading now and taking it seriously. A common mistake I see is that athletes will eat less during this time because their working less. You might not be lifting lots of weight, but your body is working hard to recuperate from everything you've done to it this far. I also see a lot of athletes saunter in, give 50% to their "easy workouts" and saunter out in half the time they usually spend in the gym. As tempting as it is to get back home for The Daily Show (You shouldn't be up that late anyways! Go to bed!) spend almost as much time in the gym as you normally would do and get that self soft tissue work done! Focus on joints and muscles you might not regularly work on. Go forth, get strong, be useful.